Hacking Managing News, part 1: Adding a Starred channel | There's a module for that! One of my first tasks was to allow users to mark articles with a star, and to find those starred items in their own channel. In MN, channels are lists of articles that are tagged with a specific set of tags. The channel is defined by its tags, and the MN views logic dynamically creates the list by matching a channel's tags with existing articles. Of course, the starring logic is different: an article's star has nothing to do with tags. But from a usability perspective, we felt that users would intuitively search for their starred items in the channels, since this is the section where content is manually organized. 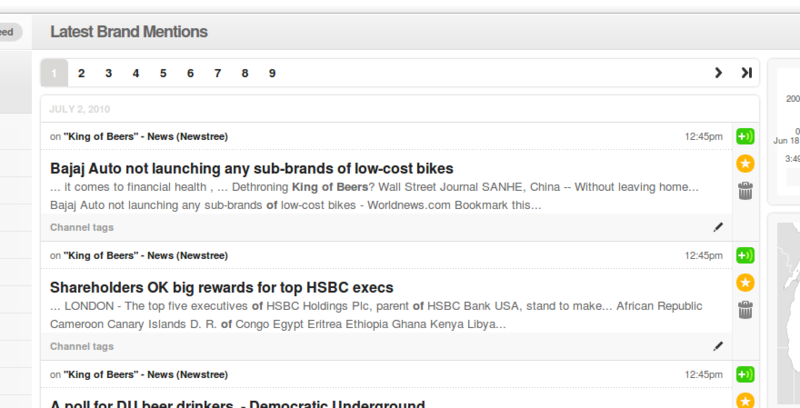 That's why we decided to have a "Starred" channel that would list all starred articles. What follows is a description of how I implemented this feature. Fortunately, MN already uses a marking mechanism, namely the Mark module, based on the flexible Voting API. It is used in MN to mark items as trashed, so I created a new mark called "star" and associated it with the Data table "feeds_data_syndication" (at admin/settings/mark). When I edited these views, I noticed there are many displays, so I made sure to add the new field everywhere the "Syndication: trash" appears. I also removed the label from the field, because the theme will take care of displaying the Star icon where necessary. Create a new channel entitled "Starred". The title will be important later on. Provide any tag (e.g. star) although it will not be used. Remove the argument "Node: Nid"
Remove the relationship "Data taxonomy: Nodes with term." Add a new relationship "Syndication: Votes" with Value type = "Mark" and Vote tag = "star". Call this relationship "Stars". Add a new filter "Votes: Value" on relationship "Stars" with operator "Is not empty (NOT NULL)". Make sure these changes apply to all displays. In Conditions > Views, add the new view starred_channel_news. Change Conditions > Views to apply to our new view starred_channel_news instead of mn_channels_news. That's it! I didn't particularly enjoy hacking into MN's modules, so please let me know if you see a better way! Nice tutorial. Rather than hack mn_channels_views_handler_field_item_count, you could duplicate it, include the duplicate in your custom module, and use a views default alter hook to switch the default views in MN to use your custom handler. This would get you closer to the point of wrapping this hack into a downloadable feature that can simply be dropped in and turned on for any MN site. I updated the code for profiles/managingnews/modules/features/mn_channels/views/mn_channels_views_handler_field_item_count.inc. Adding the star mark had caused the original channel count to fail. It happens! The updated code is in the article body.